The large Gran Via Fernando el Catolico is one of Valencia’s more traditional streets. With traffic travelling in both directions, it covers the area from the Plaza de España, located right in the centre of the city, to the old riverbed of the Turia towards the northeast. This neighbourhood is also known as Extramurs as it was built outwith the wall that protects Valencia’s historical centre. The Quart towers form the entrance to this area, and to the Ciutat Vella, and were a means of entering the walled city up until 1865. For the most part, the area surrounding this big street is exclusive. A large part of the area is of traditional design and is quite similar to the surrounding area, for example, of Gran Via Marqués del Turia. The roads are wide, with plenty of trees, and a multitude of shops. All types of services are available here, and it is located conveniently close to the centre, the city’s commercial zone. There are good schools located within the area, and excellent transport links to all parts of the city and its surrounding area. Furthermore, many bus routes run through the area and there are various metro stops all over. The Estación del Norte train station is also located here, to the far northeast. 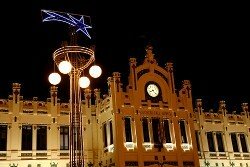 For those not familiar with the area, this is Valencia’s main train station. The Norte (north) in the station’s name does not refer to its geographical position, but to the company who built it: Ferrocarriles del Norte. In fact, geographically-speaking, the station should be called “Central Station”. The building was designed by Demetrio Ribes in the modernist, Viennese Sezession style. Over time, it has become one of the city’s landmarks and its widespread usage means that it has never been seen as a mere decoration. The Estación del Norte now runs high-speed lines to Madrid and Barcelona, and lines throughout the whole outer Valencia area. Valencia’s old Abastos (supplies) market is one of the most important buildings in Extramurs. As the name would suggest, it was a building created for the supply of goods, built during the 1940s. As the city grew, its central situation meant that it was no longer convenient, and the supplies markets were moved outside the city. The building was left derelict during the 1970s and 1980s, but has been renovated, retaining its traditional baroque style. Today it is used as a sports and leisure centre for the public. Valencia’s Botanical Gardens were built in 1567, and are situated between Gran Via Fernando el Católico, Calle Quart, and Paseo de la Petxina (the old riverbed). They are the fourth oldest botanical gardens in the world, following only Padua, Pisa and Florence. The gardens are a nature retreat located just a stone’s throw from the centre, and boast an impressive variety of plants from a series of diverse locations. This is the perfect place to go for a walk and learn about nature, as well admiring one of the largest adult palm tree collections in Europe. Although technically located within Ciutat Vella, The IVAM (Valencia Modern Art Institute) is next to Extramurs, very near to the Quart Towers. It was the first museum entirely dedicated to modern art in Spain and, today, is one of the most important in Valencia, with a collection of over 10,000 permanent works, and temporary exhibitions by the most important artists of the 20th century. The Finca Roja (Red Building) is another outstanding building found in Extramurs. It is located to the southwest of the city, on Calle Jesús, and was designed by Enrique Viedma Vidal, abiding by the rules of architectural rationalism and expressionism of the school of Amsterdam. Its colour, obviously red, contrasts strikingly with the other buildings in the area. Browse Abastos property for sale listings.